This is a very well done fan video for "New York State of Mind"." ​To listen to the studio version of "New York State of Mind" from Turnstiles, click here (audio only). 1976: Billy and the band perform "New York State of Mind" on The Mike Douglas Show. This is a great version. 1976: Live at the Capital Theater, October 2, 1976. 1977: Live at Nassau Coliseum (audio) on Long Island in New York. 1987: This is partial version of "New York State of Mind" from the documentary on Billy's concerts in Russia in 1987. 1988: New York State of Mind" on the Grammy Awards Show in 1988 with David Sanborn on sax. 1996: Billy plays NYSOM at a Master Class. 2001: Billy performed "New York State of Mind" after 9/11 in the televised program "America: A Tribute To Heroes" (above) and in the Concert for New York City. 2001: From a Master Class at UPenn (aired on A&E as "In His Own Words." 2001: Live version (audio) of "New York State of Mind" from the Concert for New York City, released on the 2015 collection My Lives. 2010: Live at the Rock and Roll Hall of Fame 25th Anniversary Show with Bruce Springsteen. 2013: Live at the New Orleans JazzFest, go to 19:25. 2014: Live at the ASCAP Centennial Awards. 2014: The "duet" with Barbara Streisand (audio only). This is high quality video set to an abridged version of "New York State of Mind," created by Fredrik M (Sweden). 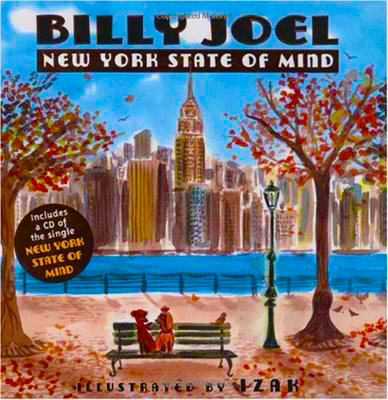 Billy plays New York State of Mind in 2014? The Making of "New York State of Mind"
Billy discusses how NYSOM came to him suddenly. From The Howard Stern Show (2010) (at 21:24). For a YouTube playlist of thirty-three cover versions of "New York State of Mind," click here. A few are shown below. Tony Bennett and Billy Joel did a duet version of the song in 2002 which received a Grammy nomination. Alicia Keys singing "New York State of Mind." This is a fantastic acoustic guitar cover of the song from a Keri Prather.